RayBio® Human IL-11 ELISA Kit for cell culture supernatants, plasma, and serum samples. This ELISA kit shows no cross-reactivity with any of the cytokines tested: Human Angiogenin, BDNF, BLC, ENA-78, FGF-4, IL-1 alpha, IL-1 beta, IL-2, IL-3, IL-4, IL-5, IL-7, IL-8, IL-9, IL-10, IL-12 p70, IL-12 p40, IL-13, IL-15, I-309, IP-10, G-CSF, GM-CSF, IFN-gamma, Leptin, MCP- 1, MCP-2, MCP-3, MDC, MIP-1 alpha, MIP-1 beta, MIP-1 delta, PARC, PDGF, RANTES, SCF, TARC, TGF-beta, TIMP-1, TIMP-2, TNF-alpha, TNF-beta, TPO, VEGF. Prasad R., Suchetha A., Lakshmi P., et al. Interleukin-11 - its role in the vicious cycle of inflammation, periodontitis and diabetes: A clinicobiochemical cross-sectional study. J Indian Soc Periodontol. 2015 Mar-Apr;19(2):159-63. doi: 10.4103/0972-124X.152108. This kit work well for us. 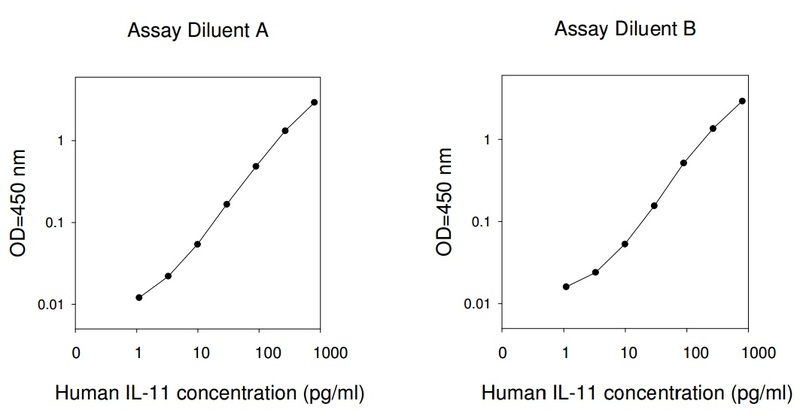 We measured IL-11 in cell culture supernatant and we are able to detect the IL-11 in both supernatant directly without concentrating it.